Not everything fits best in a round tube container. 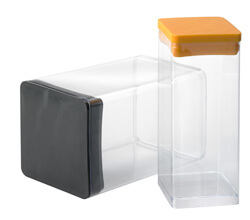 Square tube containers will not roll off a shelf and can be stacked. Like our round tube containers, square plastic tubing containers have excellent clarity and offer the same printing options. Caps and plugs are available in sizes and styles shown in the selection chart. We do not stock this product. Each order is produced to the length requested. To order this product, please call our toll free number or send an email to customerservice@visipak.com.